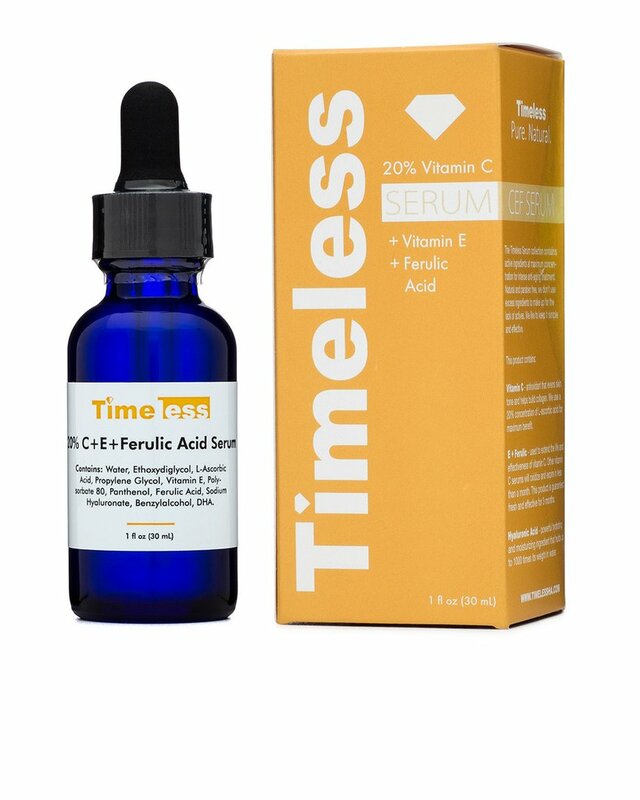 The Timeless Vitamic C + E + Ferulic Acid serum claims to even skin tone and help build collagen for a fully nourished, replenished, flawless and ageless look. Vitamin C is essential for healthy skin. It has many healing properties including the ability to decrease sun damage and dehydration plus reduce the appearance of wrinkles and fine lines. As such, it is considered a superstar ingredient in skincare. Vitamin C comes in several forms. Ascorbic acid (often referred to as L-ascorbic acid) is considered it’s most potent, highly effective at concentrations of 20% and above. Studies have found that using Vitamin C topically for at least 12 weeks can result in a visible decrease in wrinkles and skin damage, improvement in skin texture and tone and a boost in collagen production. As we age, the skin’s ability to produce collagen decreases. An abundance assures we are wrinkle free in our youth but as the years pass, fine lines begin to appear. Vitamin C can help to regulate the production of collagen. 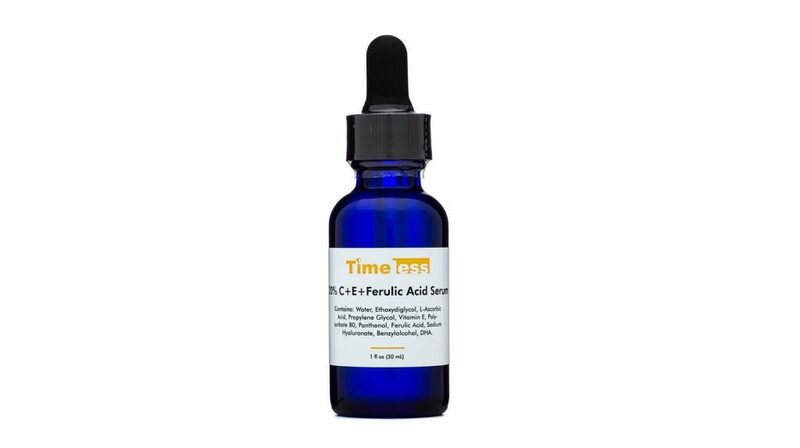 Topical vitamin C has also been shown to reverse some of the age-related structural changes in the skin, however, its not always apparent in everyone and cannot totally eliminate wrinkles either. 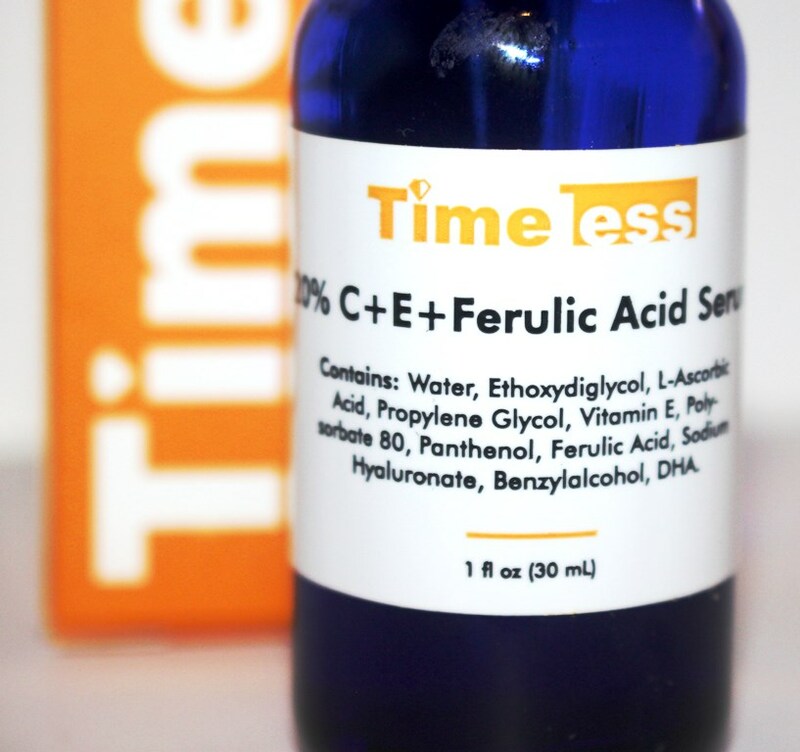 Due to their strong anti-oxidant properties, Vitamin C together and Ferulic acid, display a proven ability to limit the impact of overexposure to UV rays protecting against UV-induced damage caused by free radicals. Neither is a sunscreen substitute however, when applied with sunscreen, they present a formidable opponent in the fight against sun damage. Vitamin C is also easily absorbed into the skin, assisting to decrease water loss and boost moisture retention making it a great hydrating agent for dry skin. Furthermore, it enhances the skin’s ability to repair itself, speeding up cell turnover with an increased ability to remove accumulated dead and damaged skin cells. As a result, hyperpigmentation and acne scarring concerns are eased by breaking up dark spots and rejuvenating dull skin for a brighter complexion and improved texture. However, it’s not all sunshine and rainbows as the one major disadvantage of using Vitamin C in its most potent form (ascorbic acid), is its instability. It will degrade with exposure to air, heat and light. Once oxidized, it’s properties are simply useless. The stability and effectiveness of topical vitamin C may however be increased by combining it with Vitamin E.
Alpha Tocopherol is the Vitamin E component in the formula contributing rich antioxidants to help combat the damaging effects of free radicals. Sodium hyaluronate is the salt of hyaluronic acid, used to moisturise the skin. 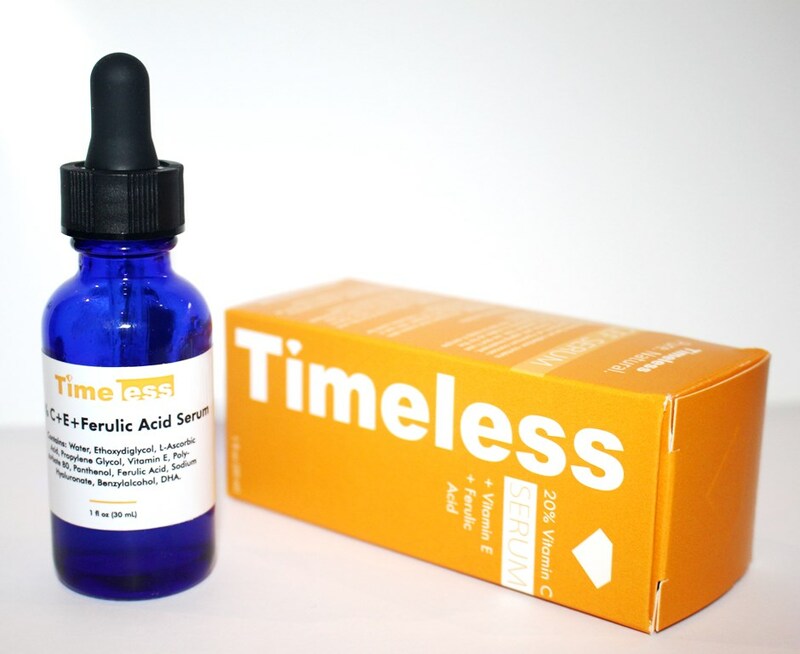 Hyaluronic acid forms naturally in the body but decreases with age. With the addition of sodium hyaluronate, the skin’s moisture content as well as its ability to retain moisture are given a boost. A handful of other products also serve their purpose in this formula. Ethoxydiglycol is a solvent used to decrease viscosity; Propylene Glycol is a humectant used to keep products from melting or from freezing and Dehydroacetic Acid, a preservative. Benefits of Panthenol include its ability to be readily and deeply absorbed, permitting it to infuse water into the cells and retain moisture. Based on the properties of the formula, it appears that science backs the product claims. Consisting of a relatively short list of ingredients and with claims of natural, paraben, colour and fragrance free products with less fillers, the clean results of the CosDNA analysis and the EWG Skin Deep Cosmetic Database (returning a low hazard rating of 3/10) are expected. 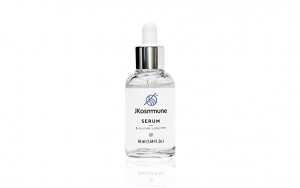 The serum comes in a dark blue glass bottle with a screw top dropper dispenser. Apply a few drops to fingertips and smooth evenly onto cleansed skin morning and/or night. For external use only. Sunscreen use recommended after application. A 30ml bottle costs US$24.95 plus shipping to Australia (US$13.06 First Class International or US$44.18 Priority International). Alternatively, there is a 120ml option for US$69.95 plus shipping to Australia (US$21.61 First Class International, US$44.18 Priority International). Regarding the shipping, it’s expensive unless you’re a local. Given the short lifespan of this product, it’s only worth getting the 120ml bottle if you’re planning to share with a few friends, in which case, you can also split the shipping costs making it more reasonable. The 30ml bottle should last the full life expectancy of the serum which is 3 months. Timeless also offer multi-purchase discounts.10% discount applies when you purchase 2 items, 20% with 3 and 30% with 4 or more items. Keep in mind they have been known to offer their full range at 50% discount and free shipping for local orders only, over the value of US$75.00, so well worth waiting for this if you’re not in a hurry. Timeless is a US company. Their products ship from there and the UK. The serum is available at the company website. They guarantee product effectiveness when you order from them so, given how time critical this can be, I would only ever order directly. You may however purchase from third party resellers like Amazon but no such guarantee applies regarding product freshness. I don’t spend US$44.18 on shipping, preferring to post first class which usually arrives within a week. Another thing to note is that the UK store has a limited range (they don’t stock the refill bottle sizes for instance) and the costs are higher (which I don’t understand since they are an International Partner). 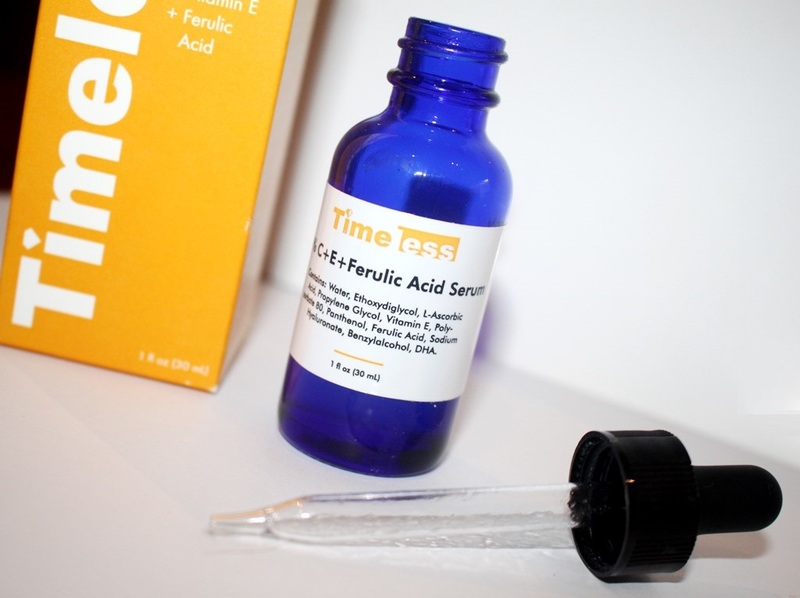 For example, the 30ml Vitamin C + E + Ferulic Acid sells for £24.99 (approximately US$32.00) so you’re already paying an additional US$7.00 for the product alone. Compare the cost of product + shipping and decide which is more economical according to where you are based. Timeless clearly states that this serum has a 3 month shelf life, commencing from the date of purchase (not date of opening). It can however be extended with refrigeration for up to around 5 months. I usually split the serum into a second bottle and keep the stored one in the refrigerator (in an opaque package) and the one I am using in the box it came in within a drawer (away from light). I have had really good success in preserving it and using it all up without waste by following this process. When it oxidizes, the serum will turn some shade of brown or red at which time it should be discarded. There is no doubt that Vitamin C is an essential ingredient in any comprehensive skincare routine, reinforced by extensive benefits identified in scientific studies. 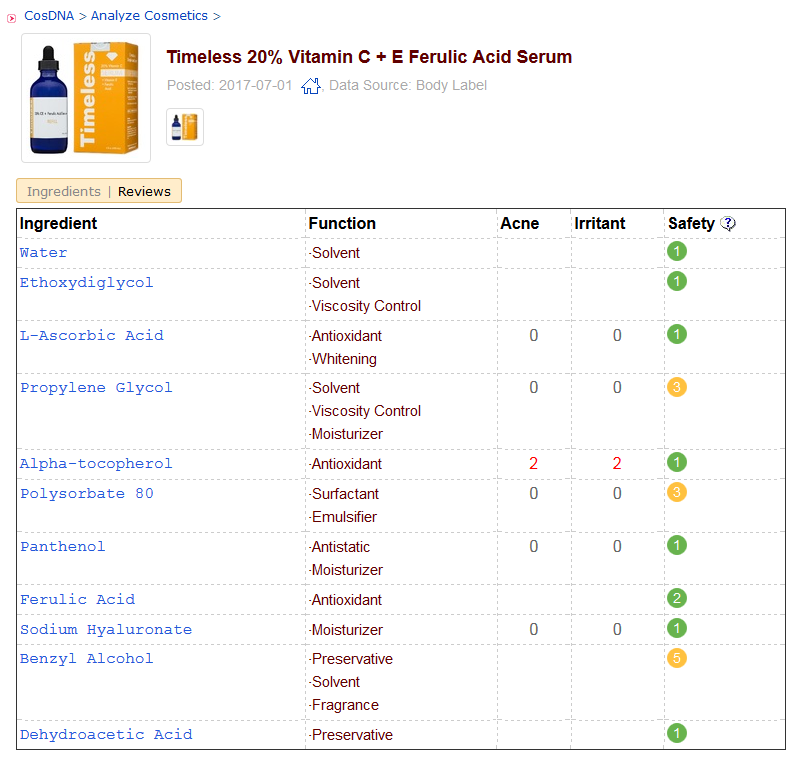 Ascorbic acid skincare products can be extremely expensive. In comparison, this option from Timeless is well priced. The packaging is good, the dark bottle minimizing light absorption but not as air tight as that from say The Drunk Elephant. But then again, who wants to spend US$80.00 on 30ml of Vitamin C when a perfectly good alternative is available? Another high end option (also with a dropper dispensing system) is from SkinCeuticals, 30ml selling for a whopping US$165.00!!! Note, both these serums include ascorbic acid at a 15% concentration, 5% less than the Timeless version. Whether the expensive alternatives are better is irrelevant, since as far as I’m concerned, the benefits of the Timeless equivalent are outstanding. Just take a look at the consumer responses on their Facebook page and website (5 star average from almost 2000 reviews). It applies easily, having the consistently and appearance of water. I apply it in the morning every day on a clean face either before or straight after a hydrating toner to maximize its absorption into the skin. It leaves no residue or stickiness, rather gets immediately soaked right in. It has no smell or physical sensation on application. I finish my morning routine with sunscreen. Since using the serum, I believe my skin tone has evened out and brightened. 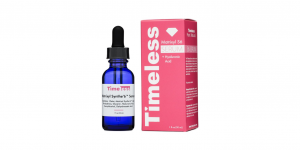 It’s hard to say whether fine lines have benefited from this product, or rather from the combination of the Vitamin C with other anti-ageing serums. The protective and brightening characteristics of this serum alone, make it worthwhile. If I can gain some level of wrinkle/fine line softening over time and achieve the “flawless, ageless look” promised, then that would be one extraordinary bonus! I don’t think I’m there just yet! Needless to say however, this is a staple that will remain for a long time in my morning routine. Hi i have vitamin c the matrixyl and a hydrating serum. In which order do you reccomend to use them?? Hi Christina, thanks for your interest and question. I like to use the Vitamin C serum first to maximize its absorption and hence benefit so I apply it straight after cleansing. For the same reason I would apply the Matrixyl serum next. I have had good results using them in this sequence, once a day. If your hydrating serum is a little thicker in consistency (like mine), it makes sense to apply this last as the general rule of layering skincare is to do it from lightest, most watery consistency to the heaviest/oiliest. If you’re using a hydrating toner as opposed to a hydrating serum, it can be applied before or after Vitamin C. Just allow each layer time to absorb. Also when using multiple serums in the one routine, if they are similar in consistency, the order you apply them in should be governed by what benefit you wish to achieve most. Just be careful not to mix acids, add too many layers in one routine or ingredients that don’t coexist well together. These serums should usually be applied no more than once a day, so perhaps limit your layers to two serums per routine to get the most from your skincare. Hope that helps! Thank you so much for the detailed answer !! Another great review Denise. This is one of my favourite Vit c serums. Mine too Kay – so simple, effective and economical. Love it! Thanks so much for taking the time to read the review.